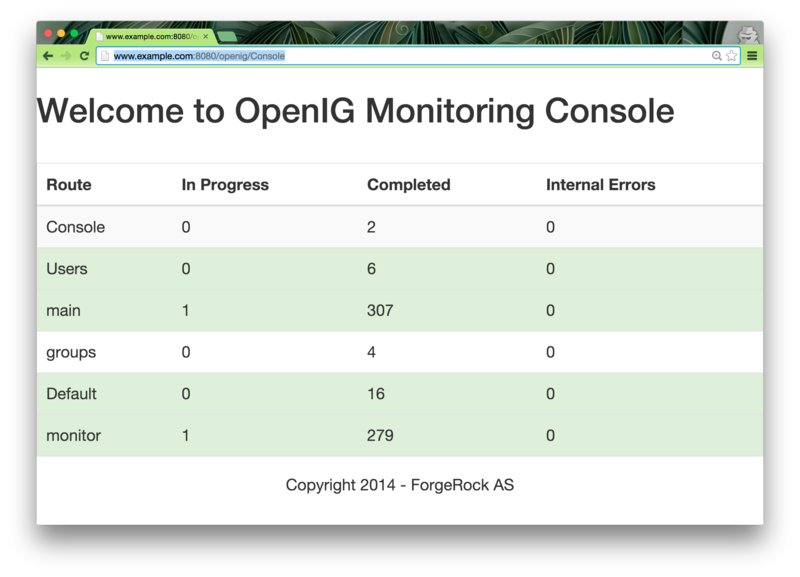 OpenIG 3.1 is almost out the doors… Just a few days of testing and it will be generally available. The new version introduces a general purpose auditing framework, and some basic monitoring capabilities. Mark wrote a blog post describing the details of the auditing framework and the monitoring endpoint. I’ve started playing with it for demonstration purposes and wanted to get more out of it. If you want to expose the monitoring endpoint, you need to add the following 00-monitor.json file under .openig/config/routes/ and decorate a few handlers as Mark describes in his post. You might also want to extend this configuration to require authentication and avoid letting anyone have access to it. Each tag represents a route in OpenIG, including the “monitor” one, “main” representing the sum of all routes. 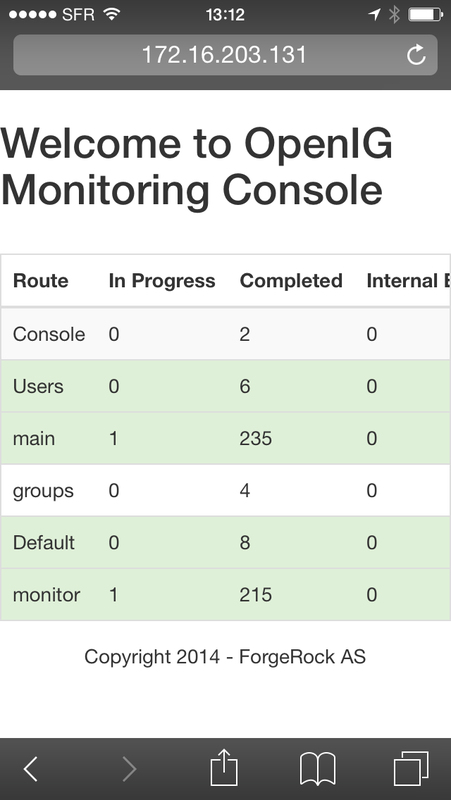 As you can see, this adds a new endpoint with its own audit: /openig/Console. The endpoint can be protected like any other route using OAuth2.0, OpenID Connect, SAML or basic authentication. Let’s look at what I’ve done. I’ve added a new route under ~/.openig/config/routes: 00-console.json with a single StaticResponseHandler. Instead of adding the whole content in the json file, I’ve decided to let the handler load the whole content from a file (named console.html). This allows me to separate the logic from the content. Note that if you are copying the 00-console.json file, you will need to edit the file location to match the absolute path of your console.html file. Now the console.html file is actually a little bit long to display here. But you can download it here.